BAE Systems has demystified some of the biggest threats to businesses by profiling six prominent types of cyber criminals and exposing how they can cause harm to companies around the globe. 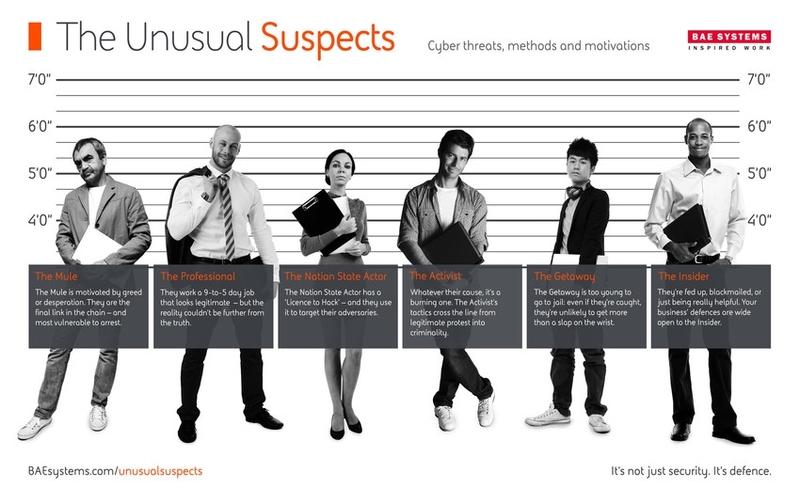 The six prominent types of cyber criminals identified by BAE Systems. Threat intelligence experts at BAE Systems have identified “The Unusual Suspects,” based on research that uncovers the motivations and methods of the most common types of cyber criminals. The intention of the company’s information campaign is to help enterprises understand the various enemies they face so they can better defend against cyber attacks. For more information on each of the Unusual Suspects, visit www.baesystems.com/unusualsuspects.